H&C applications can only be made when applying for permanent resident status in Canada or for a permanent resident visa from abroad. H&C factors are not considered for temporary residence applications. You can only have one H&C application considered at the same time. It is important to note that an H&C officer will not assess risk linked to persecution, risk to life, cruel and unusual treatment or punishment. These factors can only be assessed in a refugee claim. 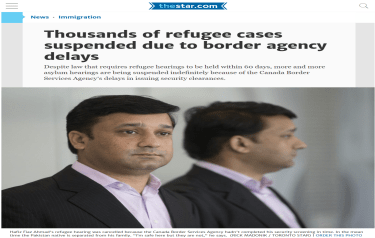 A refugee claim and an H&C application cannot be considered simultaneously. If you have a pending refugee claim, you must withdraw the claim before the hearing at the Immigration and Refugee Board (IRB). This does not apply to people with pending refugee claims who applied for H&Cs before June 28, 2012. If you are ordered to leave Canada, you may be able to apply to stay on humanitarian and compassionate grounds. However, if you apply, this will not stop or delay your removal from Canada. You must still leave on or before the date stated on the removal order. Your application will be processed even if you have to leave Canada. If your H&C application is rejected, you may apply to the Federal Court of Canada for a judicial review of your negative H&C.